My latest design is a piece for The BagSmith to show at TNNA. Made with 2 (125yds/115m each) of their new merino bumbs and a #50(25mm) needle. This oversized coat is knit cuff to cuff and from the top down. The hardest techniques involved are an invisible cast on, short row shaping and either grafting or a 3 needle bind off. I would have to rate this for an intermediate knitter. S/M/L sizes available. This is a piece I would wear everyday in the winter, the merino feels so good and I love the oversized fit. another beauty...garter stitch looks so good with those big stitches! Oh my! What a lovely thing to cuddle up in on a cold November night. Beautiful as always. Really great. Is it really just 250 yards?? Hard to believe but yes, the yarn is so thick that it only takes @250yds. You get a lot of mileage out of it but I'm going to make another one this fall using a different weight yarn and see how it looks. I'll report back while in progress. 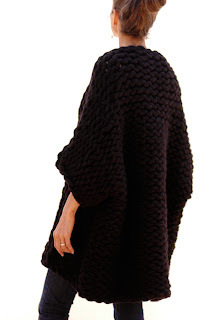 I would love to make this with a less bulky wool. Do you have a pattern for that? I don't have a pattern for a less bulky yarn but it's something I want to work on... probably within the next couple of months. HI I did buy this pattern on BagSmith. Very smart style. I started to knit it and after the first part of the body, I was lost. Cannot figure out where to pick up stiches for panels etc. Very lost with this. I think I need more visual aids. Really would like to make this.